To quote from the publisher, “in contrast with the previous edition of this book, no alterations have been made to the text other than the conversion of moves into algebraic notation, making this an updated yet accurate reflection of the original book.” However, it should have been noted that they did surreptitiously correct a few clear-cut errors from the first edition. Still, this is the edition of Fischer’s masterpiece that you have been waiting for. 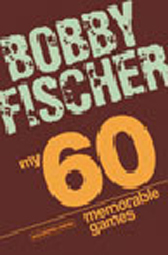 First published in 1969, this classic contains sixty of Fischer’s games played between 1957 and 1967 against such luminaries as Botvinnik, Petrosian, Smyslov, Keres, Korchnoi, and many others.